Great Great Location. Right in the middle of the city. Everything is walking distance from the hostel. The beds were super comfy and unlike other hostels they didn't had bunk beds which was a great plus ! The staff is super friendly and very flexible with the check-in and check-out timings too! Toilets and showers were super clean and the kitchen was fully equipped too. Would highly recommend it !! Nice hostel. Awesome hostel with friendly staff. Enjoyed their free pizza and popcorn during movie night. Amazing place!. Super clean. Good location, excellent friendly and helpful staff! I stayed in a 5 bedroom mixed dormitory, and the bed was comfy and everything was clean. I could say that it’s one of the best budget hostels in Budapest if you’re just looking for a central location to sleep comfortably and not necessarily party. There were multiple common spaces and all were equipped with kitchen items and sofas. Overall it was a nice stay. This hostel is cash only either in HUF or EUR. This is a very nice hostel in a very convenient part of Pest. Great Labán shop just outside. Free towels and lost of activities. Would stay again. Good staff, nice location, can walk to the main sightseeing place in Budapest, definitely a good choice in there. Everything was phenomenal except for loud groups of people arriving at late night with no regards for people who where asleep. It’s not directly the hostels fault but it would be great for them to have more control over the common area or at least tell the guests to be more mindful. Great central location. 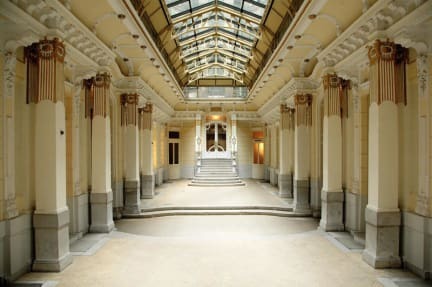 Really old, beautiful building and the staff were wonderful. Only issue with facilities was that there were two toilets for FIVE ROOMS to share?? Still, great experience. The best asset of this place is the location, the least is the bed accomodation. Beds were rather crammed altogether with narrow spaces to walk between beds. Linen was clean however matresses were rather past their shelf-life. 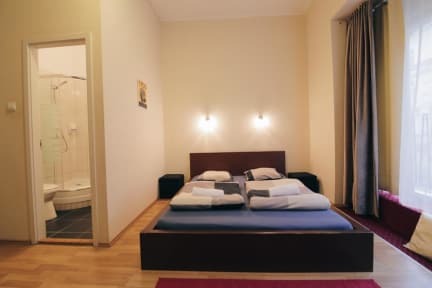 If all you need is a budget place with excellent location that will allow you to explore most of the main attractions by foot and aren't too picky about bed and room confort then it is definitely a good place to stay for a budget trip to the Hungarian capital.